AZIZ IBRAHIM worked with a number of bands in his early career, including Simply Red, but it was his replacement of guitarist John Squire in The Stone Roses, which truly announced his arrival on the scene. He has since played a key role in Ian Brown's solo career, and is about to release his own debut solo album, Lahore to Longsight, on May 27. Here, he talks to This Is The Daybreak about his career to date and plans for the future. Thanks to Aziz for giving the interview and to everyone who sent in questions. In the interview, Aziz reveals the existence of an unreleased Stone Roses song called Black Sheep. Q1) Did you enjoy your time with Simply Red ? The initial stages were brilliant. I was 22 and had never even been on a plane before; then all of a sudden I was travelling the whole world, gigs in Brazil, then Australia, Italy. 100,000 people then maybe 3000. Beautiful women, 5 star hotels, 1st class flights, money in the bank every week and in my pocket, the works ! Then the down side being constantly reminded that this was his band (Mick's), do what you're told and fit in with the band's likes and dislikes. Something like being part of a corporate team. He would rubbish other people's music and the band would agree just to keep in. First, I kept quiet, but then my big mouth would get me in trouble, or maybe it was the best thing I ever did, i.e. disagreeing ! Q2) Who approached you about becoming a member of The Stone Roses ? It was Robbie Maddix, an old friend of mine, who approached me about joining The Roses. I'd already helped with their demos i.e. Black Sheep, Nah Nah, High Times, when they couldn't get hold of John, so the invite followed the demos. Q3) Were you interested in The Stone Roses before the contact was made ? I was very envious of The Roses in the early days. There were a group of guys, mates doing music of their own, with only themselves to answer to. Having a wicked time and they didn't need to get dressed up for a gig ! Q4) Did you know any of the Stone Roses before joining them ? I never knew the Roses before I did the demos with them, prior to joining them. Saw them about rehearsal rooms and at the International Club where they used to rehearse, when they were managed by Gareth Evans, who I did know. Robbie was the only guy I knew from way back when we were in the same band. I suppose I got to know Ian first and foremost. We used to talk a lot about faith, music, religion and Jimi ! Q5) How long did you have to learn the set of tracks that you were going to play ? I had roughly a week to learn the tracks, and then a few days incognito in Southport, rehearsing, and then three days in Renaissance Gymn in Manchester. Q6) How did you set about learning the songs ? Did you listen to many bootlegs ? I didn't set out to recreate The Roses songs. I tried to keep them as faithful to the live set with John Squire as possible. In the week of learning the parts, I worked out what guitars, amps and pedals John Squire was using. Hell, I inherited his gear ! Then from a '95 Roses gig in Liverpool or Leeds, I worked out the parts as well as from the albums, for reference. The difficulty was that John's sound over the years got progressively heavier, i.e. Second Coming, hence the 1959 Les Paul and hot rodded Fender Twins. Some critics made me out a rocker, but that's how John was playing the songs in '95 ! Q7) Have you ever met John Squire ? I've never met John, but if I did I'd probably say "Sorry John, for shooting my mouth off on Radio 1 at Reading '96. It wasn't an attack against you specifically, but just a statement that I was super happy to be in the band regardless of who was there before me. I've had a serious education in western music because of you. Thanks." Q8) What is your opinion of John Squire's activities within the band, circa Second Coming ? Did you, like Ian, see it as becoming The John Squire Experience ? I loved both albums. I feel no criticisms regarding the second album at all. My favourites off Second Coming: Driving South, Ten Storey Love Song, Breaking Into Heaven, Love Spreads and Daybreak. The albums seriously are fine and that's regardless of politics and history. Q9) How do you rate John Squire as a guitarist ? He's a class guitarist and always improving. You can tell he's an artist by the way he composes and plays; without a doubt, one of the most influential guitarists from the eighties and my dad says his melodies sound a bit eastern so he must be good ! Q10) Was there any indication from the other members of the band that the Roses, while you were a member, were going to go into the studio to record a third album ? Yes. Everyone spoke of it right up to and after Reading. Then I didn't see anyone for ages until I heard Mani was leaving. Q11) If there had have been a third album, what musical direction do you think that it would have taken ? Difficult to say. If I had any say in it, something like My Star and Corpses. Seeing as we wrote Nah Nah before the demise, you can see the direction from that and the stuff I wrote for Ian after the split. Q12) Were there any songs which you would have liked to perform in your time with the Roses, but didn't for one reason or another ? I notice that Fool's Gold was only attempted once in '96 ? We fucked up Fool's Gold in Spain and no-one wanted to come back to it. Shame, as it was just a case of trying to play a song without rehearsing it ! 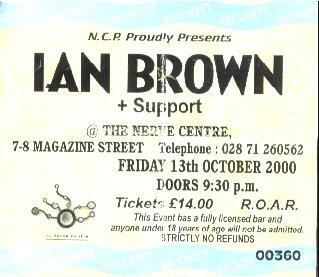 We began to rehearse it in '98 with the first Ian Brown line-up, but then Ian changed his mind. Didn't want to do any Roses tunes. I would have loved to have performed Sally Cinnamon, but only Ian and I were for putting it in the set. Ended up doing it with just Ian and myself in '98 in Japan as an encore between the two of us. Q13) Of the gigs you performed with the Roses, in which of these do you think the Roses were at their strongest ? Denmark Skanaburg was killer, as well as the fact that some bird got on stage and dropped her kecks ! Reading was the best I ever played the whole set. Second nature by then. Q14) Did the band appear to you to be a tight unit pre-Reading ? The shows over Europe got the band very tight. Everyone was waiting for me to settle in and that happened by the third gig, after the baptism of fire of Spain, and then Portugal. Q15) There were rumours of people leaving the Benicassim gig before it finished, which were strongly denied by the band at Reading '96. People leaving in droves is what some folks want to believe. We never strongly denied it, just told the truth. But if you'd rather believe the NME, Face, Melody Maker, Vox, Select arseholes at that time who had already written their headlines before each gig, what's the point discussing it ? Q16) Was there a soundcheck before the Reading '96 performance ? If so, was there not a temptation to pull the gig after it became clear that Ian's vocals were nowhere near up to scratch ? Or was there the worry that the Roses had cancelled too many shows to date ? There was no soundcheck before Reading. Just an instrumental line check. So no-one knew if Ian had a problem with his voice except Ian. Q17) At Reading the Roses played a new song called High Time. Who wrote this track and why was it never put down on record ? I heard something about the master tape being lost ? Also someone asked me if you could let him know the chords for it ! Yes, we did play a song called High Time. Robbie Maddix wrote the song and I wrote my own guitar parts which I can't remember unless someone digs out the master tape which Robbie's got, I think. It's in E ! Q18) What is your opinion of the band's performance at Reading '96 ? The best ! People stayed in droves. Q19) Did you speak to Ian immediately after the Reading performance ? What was his immediate reaction to what had just happened ? All Ian said straight after was that he was sorry. He'd been smoking all night. Q20) Who seemed to take the main decision in calling it quits after Reading, or was it a concerted agreement among the band members ? I don't know about decisions, but Mani left, so without him there was no point. So, Ian announced the end. I hadn't seen or heard from anyone so I found out after the papers found out. Q21) Would you have been willing to carry on ? No, there would have been no point. Better to set up something fresh. Q22) Can you envisage the Roses ever reforming in one form or another ? I can't. I think it would be the worst thing possible. The Stone Roses are a legend. Why tarnish it with a money making get-together tour ? Q23) Is there anything you would change if you had your time with The Roses again ? For example, should the band have spent more time rehearsing together (and writing more songs of the quality of High Time) before gigging ? Or was there a need to gig immediately to prove, in a sense, that the band could survive without Squire ? The only thing that I'd change during my time is my words on Radio 1 at Reading '96, and if you can't remember, then..good ! Q24) Do you know of any unreleased tracks or almost complete tracks of the Roses which never saw the light of day ? For example, were you working on more than two new tracks (High Time, Ice Cold Cube) but decided to just go with these two at Reading ? We were also working on Nah Nah and another song called Black Sheep, which we didn't have enough time to rehearse into the set. Q25) What was Ian's attitude towards John in the time you have spent with him in, first the Roses, and subsequently in his solo career ? Ian's attitude towards John over that time, I thought, only reflected the hurt he felt so I didn't take much notice or get involved. Q26) Has it mellowed in your opinion ? He seemed to mention it less and less as time's gone by and now it never even comes up. Q27) When was the last occasion on which you spoke with Ian, and do you plan to collaborate in the near future ? I spoke to Ian yesterday, but we spoke a few days before he began recording his third album about doing something special for the fourth album together. I saw you in Derry, Northern Ireland, which was a great gig, and spoke to you afterwards. Here are scans of the setlist and 2 tickets for the gig (the date on the ticket is not the actual date on which the gig took place - it was rescheduled to a later date). The notes beside the song titles are references to changes in sound of the guitar. Aziz has a Godin guitar which you can change the sound of radically by switches on the body of the guitar. For example, Leg = Legato, Rick = Rickenbacker, Sit = Sitar. Left to right: Ian Brown setlist at Nerve Centre, Derry, and two tickets for the gig. Q28) How would you best describe your new album, in terms of its influences ? Q29) How did the collaboration with Reni come about (he is credited with playing drums on track 3 of Lahore to Longsight, Mummy's Boy) ? I spoke to Reni after we had a top jam at his house, which even brought his missus downstairs out of curiosity ! I thought of using some funky loops of him playing for a track of mine and he saw no problem with that. Q30) What would you cite as the high point(s) of your career to date ? Brazil '87, joining The Roses, Reading '96, the creation of Unfinished Monkey Business, My Star reaching Number 5 and hearing it on the radio the first time. Corpses affect. Favourite tune of so many people. Q31) On your new album, Lahore to Longsight, released on May 27th, you have worked with a wide variety of artists. What future collaborations do you have planned ? I wanted to get Steve Craddock (guitarist of Ocean Colour Scene) and Noel Redding (bassist of 60's group, Jimi Hendrix Experience) on this album but there wasn't time, and there just wasn't the tracks. Another project. I'm definitely doing an instrumental album with Steve White (drummer for Paul Weller) in the future. That's on the cards. Might write a lot more stuff with Mani as well. Lahore to Longsight (top) and Middle Road EP (bottom) signed inserts. * This featured on the soundtrack for the Playstation game 'Eliminator' in 1998 (publisher: Psygnosis). Q32) Will your new album be available from shops ? I read somewhere that it was only going to be available to buy through the internet. Yes, for now it is only available through the net by mail order. Later on in the year, I'm planning a full release in the shops for Autumn. I prefer this kind of limited release as the most loyal fans can get hold of it. If they watch the website regularly enough, they'll get it first. Q33) Can you tell us about Ian sampling Murassi in his solo work ? Murassi was sampled by Ian for both albums - My Star on Unfinished Monkey Business and sections of it used on Under The Paving Stones: The Beach and the intro to Gettin' High. It was written and recorded about 5, 6 years ago. Q34) What is your favourite track from the new album ? 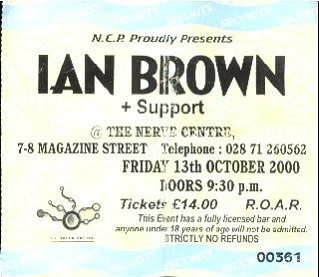 Q35) When I went to see Ian Brown at Cork in May 1999, Aziz videoed the show. Is this and other recordings of gigs going to become available soon ? Ash here from Press / Promotions Indus records. Aziz has dropped of with us a bag of about 30 tapes of Ian Brown shows and backstage / travel / recording / rehearsal tapes from 1998 onwards. We've a lot of sorting out to do and Ian wants the tapes for his use as well. So....until we can come to a decision as to the best use and direction with the tapes, I'm afraid you'll have to hang on for now. More than likely they will be previewed on http://www.aziz.co.uk. I'll do my best to get them organised for public release as soon as I can, but I'm afraid the album is going to take precedent. Believe me, the tapes are worth waiting for. It's all exclusive stuff ! Thanks to Spock, Aziz's Record Label Manager, for making this interview possible. For full details of the release of Lahore to Longsight, click here.